Improvements to the steam engine were some of the most important technologies of the Industrial Revolution, although steam did not replace water power in importance in Britain until after the Industrial Revolution. From Englishman Thomas Newcomen's atmospheric engine, of 1712, through major developments by Scottish inventor and mechanical engineer James Watt, the steam engine began to be used in many industrial settings, not just in mining, where the first engines had been used to pump water from deep workings. Early mills had run successfully with water power, but by using a steam engine a factory could be located anywhere, not just close to water. Water power varied with the seasons and was not always available. In 1775 Watt formed an engine-building and engineering partnership with manufacturer Matthew Boulton. The partnership of Boulton & Watt became one of the most important businesses of the Industrial Revolution and served as a kind of creative technical centre for much of the British economy. The partners solved technical problems and spread the solutions to other companies. Similar firms did the same thing in other industries and were especially important in the machine tool industry. These interactions between companies were important because they reduced the amount of research time and expense that each business had to spend working with its own resources. The technological advances of the Industrial Revolution happened more quickly because firms often shared information, which they then could use to create new techniques or products. From mines to mills, steam engines found many uses in a variety of industries. The introduction of steam engines improved productivity and technology, and allowed the creation of smaller and better engines. After Richard Trevithick's development of the high-pressure engine, transport-applications became possible, and steam engines found their way into boats, railways, farms and road vehicles. Steam engines are an example of how changes brought by industrialization led to even more changes in other areas. The development of the stationary steam engine was a very important early element of the Industrial Revolution. However, it should be remembered that for most of the period of the Industrial Revolution, the majority of industries still relied on wind and water power as well as horse and man-power for driving small machines. The industrial use of steam power started with Thomas Savery in 1698. He constructed and patented in London the first engine, which he called the "Miner's Friend" since he intended it to pump water from mines. Early versions used a soldered copper boiler which burst easily at low steam pressures. Later versions with iron boiler were capable of raising water about 46 meters (150 feet). The Savery engine had no moving parts other than hand-operated valves. The steam once admitted into the cylinder was first condensed by an external cold water spray, thus creating a partial vacuum which drew water up through a pipe from a lower level; then valves were opened and closed and a fresh charge of steam applied directly on to the surface of the water now in the cylinder, forcing it up an outlet pipe discharging at higher level. The engine was used as a low-lift water pump in a few mines and numerous water works, but it was not a success since it was limited in pumping height and prone to boiler explosions. The first practical mechanical steam engine was introduced by Thomas Newcomen in 1712. Newcomen apparently conceived his machine quite independently of Savery, but as the latter had taken out a very wide-ranging patent, Newcomen and his associates were obliged to come to an arrangement with him, marketing the engine until 1733 under a joint patent. Newcomen's engine appears to have been based on Papin's experiments carried out 30 years earlier, and employed a piston and cylinder, one end of which was open to the atmosphere above the piston. 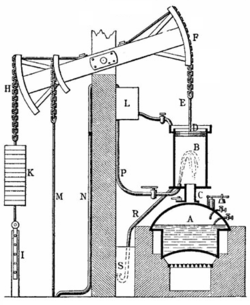 Steam just above atmospheric pressure (all that the boiler could stand) was introduced into the lower half of the cylinder beneath the piston during the gravity-induced upstroke; the steam was then condensed by a jet of cold water injected into the steam space to produce a partial vacuum; the pressure differential between the atmosphere and the vacuum on either side of the piston displaced it downwards into the cylinder, raising the opposite end of a rocking beam to which was attached a gang of gravity-actuated reciprocating force pumps housed in the mineshaft. The engine's downward power stroke raised the pump, priming it and preparing the pumping stroke. At first the phases were controlled by hand, but within ten years an escapement mechanism had been devised worked by of a vertical plug tree suspended from the rocking beam which rendered the engine self-acting. A number of Newcomen engines were successfully put to use in Britain for draining hitherto unworkable deep mines, with the engine on the surface; these were large machines, requiring a lot of capital to build, and produced about 5 hp. They were extremely inefficient by modern standards, but when located where coal was cheap at pit heads, opened up a great expansion in coal mining by allowing mines to go deeper. Despite their disadvantages, Newcomen engines were reliable and easy to maintain and continued to be used in the coalfields until the early decades of the nineteenth century. By 1729, when Newcomen died, his engines had spread to France, Germany, Austria, Hungary and Sweden. A total of 110 are known to have been built by 1733 when the joint patent expired, of which 14 were abroad. In the 1770s, the engineer John Smeaton built some very large examples and introduced a number of improvements. A total of 1,454 engines had been built by 1800. A fundamental change in working principles was brought about by James Watt. With the close collaboration of Matthew Boulton, he had succeeded by 1778 in perfecting his steam engine which incorporated a series of radical improvements, notably, the use of a steam jacket around the cylinder to keep it at the temperature of the steam and, most importantly, a steam condenser chamber separate from the piston chamber. These improvements increased engine efficiency by a factor of about five, saving 75% on coal costs. The Newcomen engine could not, at the time, be easily adapted to drive a rotating wheel, although Wasborough and Pickard did succeed in doing so in about 1780. However, by 1783 the more economical Watt steam engine had been fully developed into a double-acting rotative type with a centrifugal governor, parallel motion and flywheel which meant that it could be used to directly drive the rotary machinery of a factory or mill. Both of Watt's basic engine types were commercially very successful. By 1800, the firm Boulton & Watt had constructed 496 engines, with 164 driving reciprocating pumps, 24 serving blast furnaces, and 308 powering mill machinery; most of the engines generated from 5 to 10 hp. An estimate of the total power that could be produced by all these engines was about 11,200 hp. This was still only a small fraction of the total power generating capacity in Britain by waterwheels (120,000 hp) and by windmills (15,000 hp); however, water and wind power were seasonably variable. Newcomen and other steam engines generated at the same time about 24,000 hp. 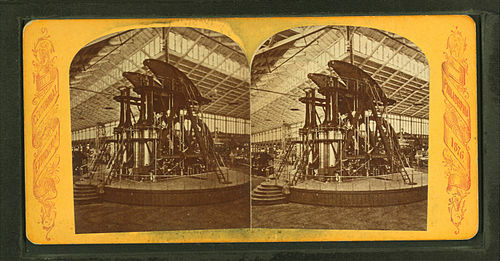 In the early 19th century after the expiration of the Boulton & Watt patent in 1800, the steam engine underwent great increases in power due to the use of higher pressure steam which Watt had always avoided because of the danger of exploding boilers, which were in a very primitive state of development. Until about 1800, the most common pattern of steam engine was the beam engine, built as an integral part of a stone or brick engine-house, but soon various patterns of self-contained portative engines (readily removable, but not on wheels) were developed, such as the table engine. Further decrease in size due to use of higher pressure came towards the end of the 18th Century when the Cornish engineer, Richard Trevithick and the American engineer, Oliver Evans, independently began to construct higher pressure (about 40 pounds per square inch (2.7 atm)) engines which exhausted into the atmosphere, although Arthur Wolf working at the Meux Brewery in London was already experimenting with higher pressure steam, in his efforts to save coal. This allowed an engine and boiler to be combined into a single unit compact and light enough to be used on mobile road and rail locomotives and steam boats. Trevithick was a man of versatile talents, and his activities were not confined to small applications. Trevithick developed his large Cornish boiler with an internal flue from about 1812. These were also employed when upgrading a number of Watt pumping engines, by this time Arthur Wolf had already produced high pressure engines whilst working at Meux brewery in London, in his efforts to improve efficiency, thus saving coal, as he had been trained by Joseph Bramah in the art of quality control, which resulted in him becoming chief engineer at Harveys of Hayle in Cornwall, by far the largest and leading manufacturer of steam engines in the world. The Cornish engine was developed in the 1810s for pumping mines in Cornwall. It was the result of using the exhaust of a high pressure engine to power a condensing engine. The Cornish engine was notable for its relatively high efficiency. Corliss kept a detailed record of the production, collective horsepower, and sales of his engines up until the patent expired. He did this for a number of reasons, including tracking those who infringed on the patent rights, maintenance and upgrade details, and especially as data used to extend the patent. With this data, a more clear understanding of the engine's influence is provided. By 1869, nearly 1200 engines had been sold, totaling 118,500 horsepower. Another estimated 60,000 horsepower was being utilized by engines that were created by manufacturers infringing on Corliss's patent, bringing the total horsepower to roughly 180,000. This relatively small number of engines produced 15% of the United States’ total 1.2 million horsepower. The mean horsepower for all Corliss engines in 1870 was 100, while the mean for all steam engines (including Corliss engines) was 30. Some very large engines even allowed for applications as large as 1,400 horsepower. Many were convinced of the Corliss engine's benefits, but adoption was slow due to patent protection. When Corliss was denied a patent extension in 1870, it became a prevalent model for stationary engines in the industrial sector. By the end of the 19th century, the engine was already having a major influence on the manufacturing sector, where it made up only 10% of the sector's engines, but produced 46% of the horsepower. The engine also became a model of efficiency outside of the textile industry as it was used for pumping the waterways of Pawtucket, Rhode Island in 1878 and by playing an essential role in the expansion of the railroad by allowing for very large-scale operations in rolling mills. Many steam engines of the 19th century have been replaced, destroyed, or repurposed, but the longevity of the Corliss engine is apparent today in select distilleries where they are still used as a power source. Water power, the world's preceding supply of power, continued to be an essential power source even during the height of steam engine popularity. The steam engine, however, provided many benefits that couldn't be realized by relying solely on water power, allowing it to quickly become industrialised nations' dominant power source (rising from 5% to 80% of the total power in the US from 1838-1860). While many consider the potential for an increase in power generated to be the dominant benefit (with the average horsepower of steam powered mills producing four times the power of water powered mills), others favor the potential for agglomeration. Steam engines made it possible to easily work, produce, market, specialize, viably expand westward without having to worry about the less abundant presence of waterways, and live in communities that weren't geographically isolated in proximity to rivers and streams. Cities and towns were now built around factories where steam engines served as the foundation for the livelihood of many of the citizens. By promoting the agglomeration of individuals, local markets were established and often met with impressive success, cities quickly grew and were eventually urbanized, the quality of living increased as infrastructure was put in place, finer goods could be produced as acquisition of materials became less difficult and expensive, direct local competition led to higher degrees of specialization, and labor and capital were in rich supply. In some counties where the establishments utilized steam power, population growths were even seen to increase. These steam powered towns encouraged growth locally and on the national scale, further validating the economic importance of the steam engine. This period of economic growth, which was ushered in by the introduction and adoption of the steamboat, was one of the greatest ever experienced in the United States. Around 1815, steamboats began to replace barges and flatboats in the transport of goods around the United States. Prior to the steamboat, rivers were generally only used in transporting goods from east to west, and from north to south as fighting the current was very difficult and often impossible. Non-powered boats and rafts were assembled up-stream, would carry their cargo down stream, and would often be disassembled at the end of their journey; with their remains being used to construct homes and commercial buildings. Following the advent of the steamboat, the United States saw an incredible growth in the transportation of goods and people, which was key in westward expansion. Prior to the steamboat, it could take between three and four months to make the passage from New Orleans to Louisville, averaging twenty miles a day. With the steamboat this time was reduced drastically with trips ranging from twenty-five to thirty-five days. This was especially beneficial to farmers as their crops could now be transported elsewhere to be sold. The steamboat also allowed for increased specialization. Sugar and Cotton were shipped up north while goods like poultry, grain and pork were shipped south. Unfortunately, the steamboat also aided in the internal slave trade. With the steamboat came the need for an improved river system. 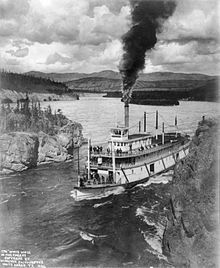 The natural river system had features that either wasn't compatible with steamboat travel or was only available during certain months when rivers were higher. Some obstacles included rapids, sand bars, shallow waters and waterfalls. To overcome these natural obstacles, a network of canals, locks and dams were constructed. This increased demand for labor spurred tremendous job growth along the rivers. The economic benefits of the steamboat extended far beyond the construction of the ships themselves, and the goods they transported. These ships led directly to growth in the coal and insurance industries, along with creating demand for repair facilities along the rivers. Additionally the demand for goods in general increased as the steamboat made transport to new destinations both wide reaching and efficient. After the first steamboat was invented and achieved a number of successful trials, it was quickly adopted and led to an even quicker change in the way of water transport. In 1814, the city of New Orleans recorded 21 steamboat arrivals, but over the course of the following 20 years that number exploded to more than 1200. The steamboat's role as a major transportation source was secured. The transport sector saw enormous growth following the steam engine's application, leading to major innovations in canals, steamboats, and railroads. The steamboat and canal system revolutionized trade of the United States. As the steamboats gained popularity, enthusiasm grew for the building of canals. In 1816, the US had only 100 miles of canals. This needed to change, however, as the potential increase in traded goods from east to west convinced many that canals were a necessary connection between the Mississippi-Ohio waterways with the Great Lakes. The use of steam engines on railroads proved to be extraordinary in the fact that now you could have large amounts of goods and raw materials delivered to cities and factories alike. Trains could deliver these to places far away at a fraction of the cost traveling by wagon. Railroad tracks, which were already in use in mines and various other situations, became the new means of transportation after the first locomotive was invented. ^ a b c d Hunter, Louis C. (1985). A History of Industrial Power in the United States, 1730–1930, Vol. 2: Steam Power. Charolttesville: University Press of Virginia. ^ a b Hunter, Louis (1979). A History of Industrial Power in the US, 1780-1930, Vol I. The University Press of Virginia. ^ a b Rosenberg, Nathan; Trajtenberg, Manuel (2004). "A General Purpose Technology at Work: The Corliss Steam Engine in the late 19th Century US". The Journal of Economic History. 64 (1): 61–99. ^ a b c d e f Hunter, Louis (1985). A History of Industrial Power in the United States, 1780-1930, Vol. II: Steam Power. Charlottesville: The University Press of Virginia. ^ Tribe, J (1903). Compound Corliss Engines. Milwaukee, Wisconsin: Milwaukee, Tribe. ^ Burn, D. L. (January 1931). "The Genesis of American Engineering Competition, 1850-1870". Economic History Review. ^ Sheldon, F. F. (1892). Power and Speed in Cotton Mills, Proceedings of the 27th Annual Meeting of the Northeast Cotton Manufacturers Association. Boston. ^ a b Corliss, G. H. (1870). In the Matter of the Petition of George H. Corliss for an Extension of His letters Patent for Improvements in Steam Engines. Providence: Providence Press Company. ^ a b Trowbridge, W. P. (1880). Reports on the Water-power of the United States: Statistics of Power and Machinery Employed in Manufactures. 10th U.S. Census. ^ Rasmussen, M. "Corliss Engine Group Gear Mechanisms Corliss Steam Engine". Archive.org. Retrieved 19 June 2014. ^ Atack, J; Bateman, F; Weiss, T (1980). "The Regional Diffusion and Adoption of the Steam Engine in American Manufacturing". The Journal of Economic History. 40 (2): 281–308. doi:10.1017/s0022050700108216. ^ Fenichel, A. H. (1966). "Growth and Diffusion of Power in Manufacturing 1839-1919. In Output, Employment and Productivity in the United States after 1800". National Bureau of Economic Research, Studies in Income and Wealth. 30: 443–478. ^ Atack, J (1979). "Fact in Fiction? Relative Costs of Steam and Water Power: A Simulation Approach". Explorations in Economic History. 16: 409–437. doi:10.1016/0014-4983(79)90029-9. ^ Temin, P (June 1966). "Steam and Waterpower in the Early Nineteenth Century". Journal of Economic History. ^ Krugman, P (1991). Geography and Trade. MIT Press. ^ a b Zimmer, David (1982). The Ohio River; Gateway to Settlement. Indiana Historical Society. p. 72. ^ Camfield, Gregg. "Economic Development; Mark Twain's Mississippi". Mark Twain's Mississippi. Archived from the original on 2014-10-08. Retrieved 2014-06-23. ^ Hedeen, Jane. "The Economic Impact of the Steamboat" (PDF). Indiana Historical Society. Retrieved 2014-06-23. ^ Williams, L.A. (1882). History of the Ohio Falls Cities and their Counties: With illustrations and bibliographical sketches. Cleveland: L.A. Williams and Company. p. 220. ^ "History of Steamboat on the Mississippi River". Mississippi River Cruises. Retrieved July 23, 2014. The Growth of the Steam-engine. Robert H. Thurston, A. M., C. E., New York: D. Appleton and Comithcmpany, 1878.